Ji Dong-chul is a defector from North Korea that spends his time trying to find the man that killed his wife and daughter. When he isn't doing that he maintains a simple job as a driver and chauffeurs around Chairman Park. One night Park is murdered, but Dong-chul finds him in his last moments by pure happenstance and his boss gives him a pair of glasses and tells him to "bury it." Although he isn't too sure what Park meant by that last statement he doesn't have much time to think as the South Korean Intelligence Service barges in and he is forced to run for his life. Whatever the glasses are is important to someone inside of South Korea and North Korea and both sides seem to want to be rid of Dong-chul because of his possession of them. Using Dong-chul's past with North Korea as the perfect scapegoat, the director of NIS covers up the real cause of Park's death and pins the murder solely on Dong-chul. Yeah, you'll really hate that director guy. The man put in charge of the capture of Dong-chul is Min See-hoon, a man that bears a scar and a grudge against the defector. He seems willing to do anything it takes to get his revenge against Dong-chul, but he also isn't as crooked as some of his comrades. With all of the characters in place the chase is on. While not one of the greats, The Suspect is certainly a film that will please fans of James Bond and Jason Bourne. The camera work is definitely of the shaky variety and the running time is about fifteen minutes too long, but it isn't as bad compared to Michael Bay films. This is a film that is over the top with the car chases and the intrigue even to the point that it can be a bit tough to keep up with, but it certainly is fun. I don't even know how many fists fights or car chases there were, but there a lot. However, this film really finds its pace when it slows things down a bit in the final half of the movie and the characters get their chance to actually become more than people that just run around causing explosions. 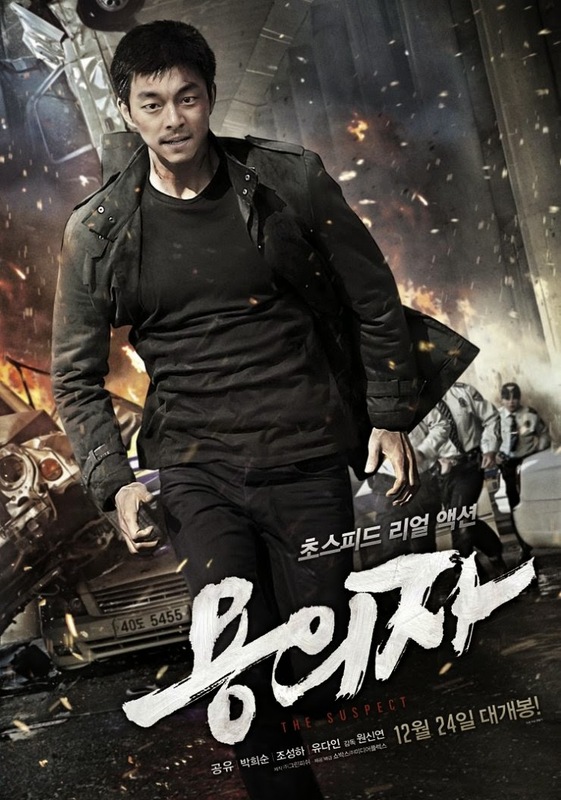 The originality from many other Korean films isn't there and this film feels more American than anything else, but it still retains enough bite and grit to make it a good movie on its own. The ending itself is also fairly satisfying. Just don't expect The Man from Nowhere or Sympathy for Mr. Vengeance. Gong Yoo is the guy that portrays and Ji Dong-chul and you might recognize him from the film Silenced (The Crucible). You might, but I didn't. To be fair I kind of blocked that movie from my memory because that one just fucked with me too much. However, this Gong Yoo guy is real good and this was the movie he made right after Silenced. Both are worth watching, but Silenced is something else entirely. However, if you want the action and something that doesn't give you a chance to get too depressed then this film will do the trick.